Dr. Brakebill was born in Loudon, Tenn., and he graduated from the University of Tennessee Knoxville and the University of Tennessee Health Science Center College of Medicine, Memphis. He completed his internship and residency at the University of Tennessee Memorial Research Hospital. Dr. Brakebill is Board Certified in internal medicine, and he is a Fellow of the American College of Physicians. He is also a Certified Physician Executive with the American College of Physicians, a member of the Tennessee Medical Association, the Knoxville Academy of Medicine and the American Medical Association. His is a member of Alpha Omega Alpha Honor Medical Society and Phi Beta Kappa. He joined Internal Medicine Associates in 1987 and was a founding member of Summit Medical Group in 1995. Dr. Brakebill lives in Knoxville with his wife, Jeanie. The couple has four children, Keith, Christopher, Brian and Erin. He enjoys running/jogging and UT athletics. 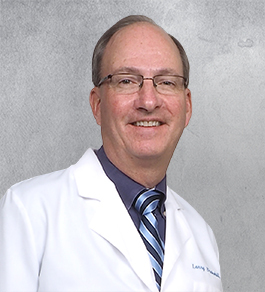 To request an appointment with Larry C. Brakebill, MD, FACP, call 865-546-9751 and press 3. Specifically request an appointment with Larry C. Brakebill, MD, FACP, with the appointment manager.